You would like to easily add users with role learner, instructor or something else, all at once. There are a lot of new learners that you want to subscribe to a course. 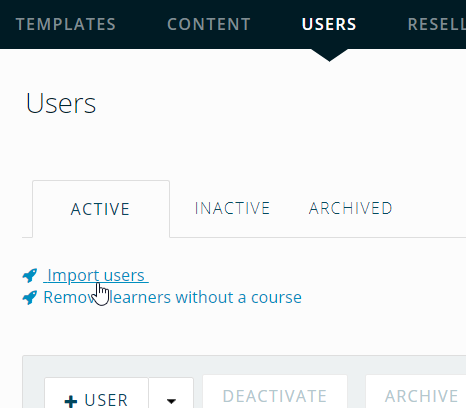 You would like to add or remove user details of existing learners. You have a lot of new users that need to get account in aNewSpring. Click the Users tab and go to Import users. You will find information about how to fill this in in this article: Importing users - Filling in the CSV file. The encoding will be 'windows-1252' if you create the file on a Windows computer in Excel. The encoding will be UTF8 if you work on a Mac or made a user export under the Users tab. The cells in your file are separated by a comma (,) or a semicolon (;). On Apple computers, in Windows 8 or in Windows in English speaking and Asian countries, columns will be separated by commas. In other cases (like up to Windows 7 on a Dutch computer), columns will be separated by a semicolon(;). In case of doubt, you can open the file in Notepad to see which character is used to separate the cells. If you see an Error code 'null' when importing, change the separator and try again. want to add / remove user details from existing learners, also see the checkbox Ignore empty fields when updating. Overwriting has no effect on existing subscriptions or achieved results. For both options it is important that you are signed in to the right subenvironment. The link in the notifications will point to the URL on which you are currently logged in. The first checkbox will only work if you filled in the column 'Course' in the CSV file. These are default notifications that the system sends, but you can edit them if you have the 'Tenant' role. See the article Editing aNewSpring notifications, they are the emails 'Account created' and 'New subscription'. If you import new learners and subscribe them at the same time, you can consider only sending the login details. Otherwise they will receive two emails. Attention: Both notifications can only be sent during import. It is not possible to send the notifications 'Account created' and 'New subscription' afterwards. This checkbox is especially relevant if you are going to Overwrite existing user. If you are subscribing users for the second time to another course and you leave the rest of the details empty, for example the address that is already filled in in the account of the user, you will have to check this box. If you don't do this, these fields will be emptied. If you want to delete account details, you should uncheck this box. The empty fields in the CSV file will be emptied in the user account. Leave the 'Password' column empty and check this box to have the system generate a password. Please note that you have enabled the checkbox Send login information via mail, so learners will receive this password by mail. You can enable this in combination with Generate password and Send login information via mail. In that case, the notification 'Resend login information' will be sent. You can also change this notification text as a tenant user. Generally we indicate what is wrong, like 'Course does not exist', 'No first name', etc. Check if there are spaces after the column names and/or in the entered data. Check the spelling of the column names, they should match the names in the instructions exactly. Check the spelling of the course name. Sometimes the column 'Login' is confused with 'Email', it is very important to fill in the email address of the user in the 'Login' column. It is not a problem to import a big amount of users, for example > 5000, at the same time. Do take into account that it can take a bit longer. You can check this as a tenant under the Settings tab.